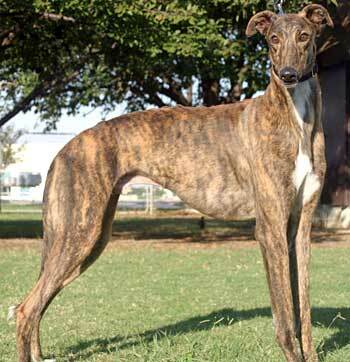 Wick, aka Wicked Willy, is a stunning almost 2-year-old dark brindle male born December 30, 2005. His sire is Mulberry Memory and his dam is Ed P's Linda. Wick, along with Gwen, was confiscated during a drug bust in Amarillo. GALT was contacted by the SWAT Captain of the Amarillo Police Department to take these two. Wick and Gwen were found in a 5x5x5 foot cage without food and water when the property was raided. They were transported to Dallas and began their new life. Fortunately, other than being thin, Wick is in good medical and physical shape. Wick shows no races to his credit on Greyhound-data.com. From an afternoon visit with the cats: Wick passed his cat test with high marks! He was curious about the cats, but not that interested. He followed them, got a sniff, then turned and walked away. Foster dog Atta showed by example by walking along side Wick and ignoring the cat when they got to the end of the kitchen. The cat was still a new thing to Wick, so he did another brief sniff and followed Attas lead. When Wick finally took a longer sniff, the cat was a bit irked at the intrusion of the big wet nose, but did not feel compelled to fight or flee. This dog was not a threat. Wick is a very sweet young dog that LOVES affection. OK, what greyhound doesn't? He's currently living with two other greyhounds and gets along well with them, and he is also very respectful of the 14-year-old terrier mix. In fact, he rests his chin on the other dogs when they're all milling around a human for attention. He mostly ignores the cat, but occasionally playfully trots after him. The cat usually just gets under the dining room table and chairs to avoid the oversized playmate, and that's the end of it. Wick seems to like toys and will romp around tossing and pouncing them. He appreciates a good bone to chew, too. He's a little jumpy until he gets used to new and unusual sights and sounds of the house, like reflections in the windows at night or an unexpected noise. He seems to be used to the cuckoo clock now, but an odd yoga posture can make a human look like a whole different creature! 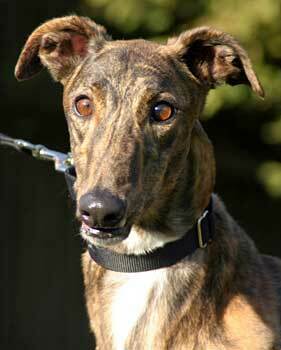 When it comes to people, Wick is quite friendly and very accepting of all the TLC and good food you want to dish out. His underbite became the new "cuteness factor" at the past meet and greet! When his mouth is open, he just appears to be smiling. 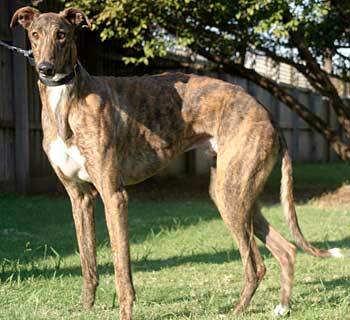 Wick was very thin upon arrival at GALT but is gradually getting some meat on his bones. With the improved nutrition and care, his personality and dark red brindle coat should be just as shiny as his sweet smile.